Assassinated in a conspiracy involving senators and Praetorian Guards. ، اتقتل. Probably poisoned by his wife Agrippina the Younger, in favour of her son Nero. Notes aThe other claimants for the throne in the Year of the Five Emperors were Pescennius Niger and Clodius Albinus, supported by the Syrian and British legions respectively. 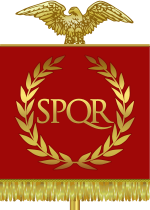 Although not completely defeated until 197 AD, they were not formally accepted by the senate and were therefore not technically reigning emperors. Died in battle against Diocletian? 14 August 582 Bornc|. 535, commander of the Excubitors, friend and adoptive son of Justin. Was named Caesar and regent in 574. Succeeded on Justin II's death. 22 November 602 Born in 539 at Arabissus, Cappadocia. Became an official and later a general. Married the daughter of Tiberius II and succeeded him upon his death. Named his son Theodosius as co-emperor in 600. Deposed by Phocas and executed on 27 November 602 at Chalcedon. 11 February 641 Born c. 575 as the eldest son of the Exarch of Africa, Heraclius the Elder. Began a revolt against Phocas in 609 and deposed him in October 610. Brought the Byzantine-Sassanid War of 602–628 to successful conclusion but was unable to stop the Muslim conquest of Syria. 15 September 668 Born on 7 November 630, the son of Constantine III. Raised to co-emperor in summer 641 after his father's death due to army pressure, he became sole emperor after the forced abdication of his uncle Heraklonas. Baptized Heraclius, he reigned as Constantine. "Constans" is his nickname. Moved his seat to Syracuse, where he was assassinated, possibly on the orders of Mezezius. September 685 Born in 652, he succeeded following the murder of his father Constans II. Erroneously called "Constantine the Bearded" by historians through confusion with his father. He repelled the First Arab Siege of Constantinople, and died of dysentery. 695 Born in 669, he was named co-emperor in 681 and became sole emperor upon Constantine IV's death. Deposed by military revolt in 695, mutilated (hence his surname) and exiled to Cherson, whence he recovered his throne in 705. الصفحه دى اتعدلت اخر مره فى 4 يوليه 2018,‏ 21:00.